Slate: So continuing on the theme of new elements to Breath of the Wild that weren’t in previous Zelda games, this is the first time where Link’s weapons could actually break, and you couldn’t re-use them endlessly. Of course, there were many, many more weapons in this game. And I wonder what the goal was with this new mechanic and how the idea came about. Fujibayashi: When we were thinking about weapons, we considered that this world is a big, open field, and we wanted players to go on an adventure. We actually called it a term “gravity,” as to pulling players into that world. We were thinking, especially because it’s a big world, if we let players just do whatever they wanted, they wouldn’t really know what to do. So, one of the things we thought about is, for example, if we place an enemy that dropped a certain weapon, then the player would feel like they want to go defeat that enemy. Because if it was really, truly free and players could do whatever, they would probably just avoid it. So instead, they would be more inclined to go defeat that enemy, and once they defeat it, they would get a certain weapon. And that was scattered all over the world. So, that was one thing we considered doing, thinking about weapons. Aonuma: In terms of making Zelda titles, figuring out how to make combat fun has always been a huge challenge. How do we let players do what they want in combat? How do we make it fun? Just pressing a button to swing a sword has the right reactive feel, but it’s also very simple. So we thought about ideas like, “Alright, well, what if you have to do more complicated button inputs to do different attacks?” or things like that. But it just sort of became too complicated and actually not very fun. So when we came up with the idea of weapons breaking, you know, if you have this nice weapon, but you know it’s going to break after a certain number of uses, you have to start thinking about, “When am I going to use it? What enemies am I going to use it on?” And that was really the way that we were able to make the simple action of swinging a sword in this game a bit more strategic, a bit more fun, a bit more in-depth, even though you’re just pressing a button to swing a sword. I think that this has always been a big challenge in Zelda titles, how to make enemy combat fun. And I think you can see, throughout the history of the Zelda titles, how we ended up here is a conglomeration of all these little, different challenges that we’ve overcome over the years of developing the different titles. Slate: And along with the wide variety of weapons, there’s also a wide variety of armor, which are different types of costumes essentially. In previous Zelda games, Link always had one or maybe a few set looks. I believe in past games it was possible to change your outfit or maybe the color of your outfit, but this is much more than that. I wonder what was the inspiration for that change. And I’d also like to ask if each of you have a favorite costume in the game. Fujibayashi: When we were thinking about clothing, we thought about the cycle of the game and how there should be new findings in the world. Also, another thing to consider was how to adapt to the world. Because the world consists of areas that were cold or hot, we thought that clothing would be a good way to adjust to that. Also, one of the things that we did want to make sure was that it was not just one way to get to a certain area. For example if it was the cold area, we want to make sure that there were different ways to adapt to that climate. For example, players could use food or they could use clothes. And by doing that, there were just many ways to adapt to that. Also, we thought many looks would be fun for players to get to choose from. So when we were thinking of clothing, that’s how we thought about it. My favorite outfit is the Hyrule Soldier’s outfit. My reasoning is that it looks cool. Aonuma: Mine actually is the Goron Armor. I think it’s probably my favorite because it’s so cumbersome. There’s all these really cool-looking outfits and armor in the game, and then there’s this thing that looks like you’re wearing a bunch of metal on your body. But I really like the way that it impacts how you play the game, and it kinda looks difficult to walk and move around in. So, I feel like the impact of it is really cool. But what do you guys think? Did you guys like the durability system? 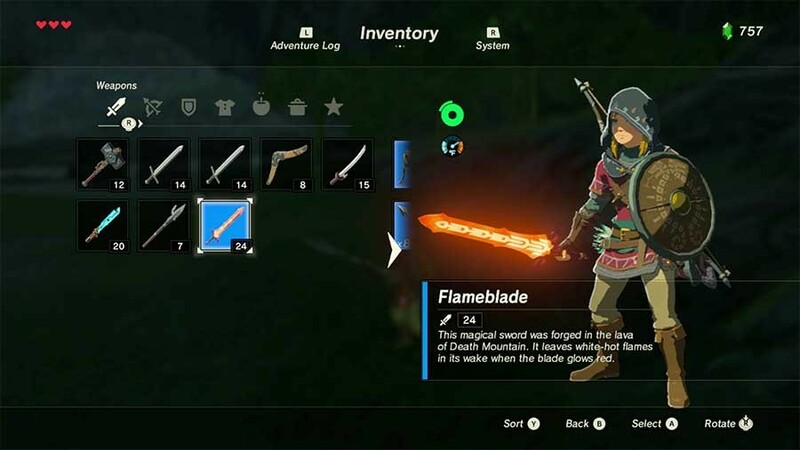 Did you guys like the variety of weapons and armor in Breath of the Wild? Let us know in the comments below!